The shell method allows you to measure the volume of a solid by measuring the volume of many concentric surfaces of the volume, called “shells.” Although the shell method works only for solids with circular cross sections, it’s ideal for solids of revolution around the y-axis, because you don’t have to use inverses of functions. Find an expression that represents the area of a random shell of the solid in terms of x. You can use a can of soup — or any other can that has a paper label on it — as a handy visual aid to give you insight into how the shell method works. To start out, go to the pantry and get a can of soup. You can also use the shell method, shown here. 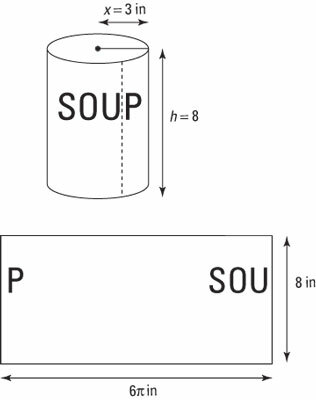 Removing the label from a can of soup can help you understand the shell method. Notice that the label is simply a rectangle. Its shorter side is equal in length to the height of the can (8 inches) and its longer side is equal to the circumference (2π · 3 inches = 6π inches). So the area of this rectangle is 48π square inches. Use this expression to build a definite integral (in terms of dx) that represents the volume of the can. The shell method verifies that the volume of the can is 72π cubic inches.